Space shuttle Endeavour, atop its Shuttle Carrier Aircraft, takes off on NASA's last-ever ferry flight from the Kennedy Space Center in Florida on Sept. 19, 2012. Endeavour is headed for Los Angeles, Calif., to be put on public display at the California Science Center. The final chapter is about to close on NASA's 30-year space shuttle program. The agency's three remaining space-flown orbiters — Discovery, Endeavour and Atlantis — each made their last flights in 2011, and are now being prepped for retired life in museums. Discovery has been gifted to the Smithsonian National Air and Space Museum's Stephen F. Udvar-Hazy Center in Chantilly, Va., while Endeavour is bound for the California Science Center in Los Angeles. Atlantis is due to stay close to home at the Kennedy Space Center Visitors Complex in Cape Canaveral, Fla. Additionally, the prototype orbiter Enterprise, which never flew to space, moved to New York City's Intrepid Sea, Air and Space Museum. Enterprise previously resided at the Smithsonian. Space shuttle Endeavour has made its last takeoff from Edwards Air Force Base in Southern California and is now heading for its aerial tour of Californai, including low flyovers of Sacramento, San Fracisco and much of the Los Angeles area. It will be placed on public display next month at the city's California Science Center. A step-by-step look at how NASA moves its giant space shuttles across the country atop rejiggered Boeing jets. Pictures of the prototype orbiter's last flight, a piggyback ride from Washington, D.C. to New York City on April 27, 2012. Cast your ballot for Columbia, Challenger, Discovery, Atlantis, or Endeavour! A pair of retrofitted jumbo 747's carried the orbiters cross country on many occasions. With the retirement of the space shuttle program, they'll make their final deliveries of Discovery, Endeavour and Enterprise to their new museum homes. Much of the space program's history is on display at museums across the United States. See where you can find some of the most iconic U.S. spacecraft that ever flew. Foul weather has delayed Endeavour's ferry flight to California by two days, to Wednesday, (Sept. 18). The space shuttle Endeavour completes final preparations for its trip to the California Science Center where it will begin a new career inspiring visitors to the wonder of space exploration. Media representatives are given the opportunity to photograph space shuttle Endeavour, secured atop NASA's Shuttle Carrier Aircraft or SCA, at the Shuttle Landing Facility at NASA's Kennedy Space Center in Florida on Sunday (Sept. 16, 2012). The SCA, a modified 747 jetliner, will fly Endeavour to Los Angeles where it will be placed on public display at the California Science Center. NASA Jets, Tickets Taking Off for Space Shuttle's Flight to L.A.
NASA's space shuttles Endeavour and Atlantis switched locations August 16, 2012, at Kennedy Space Center in Florida, and in the process came "nose-to-nose" for the last time in front of Orbiter Processing Facility 3. Science fiction met fact with a "Star Trek" twist here today (April 27) when the space shuttle Enterprise, named in honor of the starship from the beloved television show, came face-to-face with Spock — Leonard Nimoy, that is. Riding atop NASA's modified Boeing 747 carrier aircraft, NASA’s drop-test article – the not quite an Orbiter Enterprise – flew to the New York area on April 27, 2012. It's final home: the Intrepid Sea Air and Space Museum. NASA's prototype space shuttle Enterprise is now a New Yorker. It's bound for the Manhattan's Intrepid Sea, Air and Space Museum. NASA's prototype space shuttle Enterprise took off on its final flight today — a piggyback trip aboard a jumbo jet to New York City. New York City's Intrepid Sea, Air and Space Museum is gearing up to welcome the space shuttle Enterprise to its permanent collection this summer. SPACE.com caught up with the new keeper of Enterprise - the Intrepid's Eric Boehm, curator of aviation - to talk about the museum's plans for its new addition. NASA's prototype shuttle orbiter Enterprise, which had been on display at the Smithsonian National Air and Space Museum since 2003, is set to fly to the Big Apple today (April 27). The naming of the space shuttle Enterprise involves one of the funniest presidential orders of all time. NASA's prototype space shuttle Enterprise is set to fly into New York City on Friday. Here's how to see the shuttle soar over the Big Apple. Grounded for more than 25 years as a museum display, the space shuttle Enterprise will need to wait just a few more days before taking to the air for one last flight. Residents of the Big Apple may catch sight of an unusual sight over their famous skyline this week: a NASA space shuttle riding atop a jumbo jet. Space shuttle Enterprise's jet flight from Washington, D.C., to New York has gone from "on time" to "delayed." NASA's original prototype space shuttle was reunited Friday (April 20) with the jumbo jet that first ferried it for a series of important test flights in the late 1970s. With NASA's space shuttle Discovery now successfully installed in the Smithsonian, the space agency's next shuttle move on the horizon falls to Enterprise. When space shuttle Discovery began its new mission as a museum relic, it wasn't alone. More than two dozen astronauts helped usher the storied space plane into its new role as a Smithsonian exhibit. NASA officially delivered the space shuttle Discovery, its longest serving crewed spacecraft, to the Smithsonian's National Air and Space Museum on Thursday (April 19) during a public ceremony to hand over the iconic winged spacecraft. NASA's most traveled spacecraft, the space shuttle Discovery, is set to become a museum artifact today when it rolls into the Smithsonian. The space shuttle Discovery is going on display at the Smithsonian Institution's National Air and Space Museum just outside Washington, D.C., this week after taking one last flight atop its a modified Boeing 747 jet from NASA's Florida spaceport on Tuesday (April 17). NASA's space shuttle Discovery is the world's most traveled winged spaceship and the oldest in the U.S. fleet. The space shuttle Discovery will be hoisted off its ferry plane today (April 18) in a complicated ballet of cranes. Space shuttle Discovery, NASA's fleet leader and the world's most flown spacecraft, lifted off for the last time on Tuesday (April 17) to be delivered to the Smithsonian for its permanent display. See photos of space shuttle Discovery's final flight to the National Air and Space Museum's annex hangar in Chantilly, Va. The space shuttle Discovery will take to the skies one more time today (April 17), but not on the power of its own engines. NASA's most-flown space plane — will take one last flight this week, but will never leave the planet again. 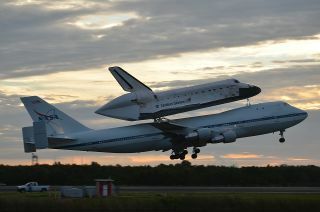 The shuttle's final mission is a piggyback ride atop a jumbo jet so Discovery can take its place as a space icon at the Smithsonian Institution. Space shuttle Discovery will take to the air on Tuesday morning (April 17), flying piggyback atop a NASA jumbo jet from Florida to Washington, D.C. to be delivered to the Smithsonian for display. Those along its flight path are in store for low passes, historic flybys and overall, quite the sky show. NASA mounted space shuttle Discovery on a jumbo jet Sunday (April 15), in preparation for the retired orbiter's delivery to the Smithsonian. The paired air- and spacecraft are expected to depart Florida for Washington, D.C., on Tuesday morning (April 17), weather permitting. NASA's scheduled pairing of the space shuttle Discovery with its jetliner ride to the Smithsonian was postponed on Saturday afternoon (April 14) after wind gusts prevented workers at the Kennedy Space Center in Florida from safely hoisting the retired spacecraft atop the modified-Boeing 747 Shuttle Carrier Aircraft (SCA). It may not be heading back into space and its crew members aren't astronauts, but space shuttle Discovery's final flight has its own mission patch. NASA's space shuttles are gearing up to make their final voyages — this time flying piggyback a special Boeing 747 jet on the way to museum retirement homes. Space shuttle Discovery's ride to retirement, NASA's modified Boeing 747 Shuttle Carrier Aircraft (SCA), has come a long way since it first took to the air in the 1970s as an American Airlines passenger jumbo jet. Space shuttle Discovery's chartered ride to retirement has arrived. A retired NASA space shuttle and an early prototype for the winged spacecraft will make their final big journeys this month, traveling to the cities that house their museum retirement homes. The world's most flown spacecraft will be welcomed by the Smithsonian Institution during a four-day public festival. While the Smithsonian gets ready to receive the retired space shuttle Discovery for display this spring, NASA, together with archivists spread across four states, is preparing to preserve the historic orbiter and its sister ships digitally and on paper. NASA's selection of display locations for retired space shuttles in California, Florida, New York and Virginia was implemented fairly and without improper influence, federal investigators reported Aug. 25. The crowd of schoolchildren, tourists and museum workers exploded in cheers yesterday when they learned New York will be the final home of NASA's prototype space shuttle, Enterprise. But not everyone is so happy. NASA unveiled the final flight plans for its three retiring space shuttles on Tuesday, assigning two to museums in Washington, DC and California, and keeping the third at its launch and landing site in Florida. A fourth, prototype orbiter will also go to a new home in New York. NASA Chief's Big Decision: Where Should the Space Shuttles Retire? All of the space shuttle orbiters will be sent to museums in places with historical ties to spaceflight, NASA chief Charles Bolden said Monday (April 11).